The bed bug is a mystery for most people. It is something we have only heard about and something in which we have a healthy amount of fear. Getting bitten is one thing, but the possibility of infesting one’s own house and affecting loved ones is another. Bed bugs are like most parasites. They hitch a ride on their hosts and go wherever their host goes. They then reproduce and expand their territory. The number one way people infect their own homes is by sleeping somewhere else and unknowingly bringing the pest back with them. This is why we have created this article, to help prevent this exact scenario. Perform a cursory examination of the furniture and window sills. Looks for small dead bugs. Pull back the bed spread and look for small pepper-like dots. Keep luggage on a luggage rack or desk. Do not let it sit on the bed at any point. If you think the room is infested with bed bugs, it is best to try to secure lodging elsewhere. Chances are if one room has bedbugs, the other rooms do as well. Inspect your suitcases before bringing them in the house. The garage or carport is a good place to do this. Look closely for tiny bugs. Wash and dry any clothes as soon as possible. Put clothes that need to go to the dry cleaners in a sealed plastic bag. 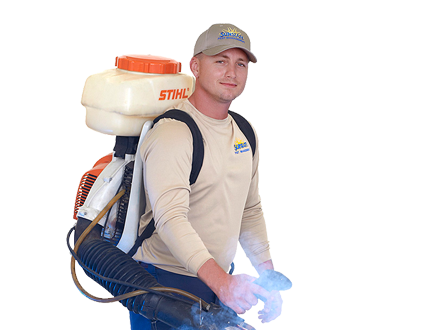 If you feel at anytime you may have brought bed bugs home contact a local professional pest control company. They have professional training in how to handle this situation.